Singer-songwriter, Nick Ippoliti, is well on his way to solidifying his creative and influential role within the music community. He succeeds in combining brilliant lyrics and an undeniable understanding of music. His growth as a singer/songwriter jumps off the album from the first track and glides through to the end. Ippoliti's voice is intriguing, taking you from the gruff sensuality found on tracks like Fallen and Punch Drunk to the whimsical Dylan-esque approach to Omar's Travelin' Machine. Lyrically Ippoliti is refreshing. His approach in combining intellect and emotion is without compromise. One thing Ippoliti is not short on is words. The array of musicians/arrangements showcased on "Tramp Art" is exceptional. As found with his first release, Ippoliti is not gun-shy about sharing and building his music with other talented musicians. All the arrangements are appropriate as well as tasteful." Ippoliti's passionate ambitions extends outside of music. Ippoliti has received an A.A in Music, B.A in Philosophy, M.S. in Education, and is expected to receive his Ph.D. in Aesthetic Studies from the University of Texas at Dallas in the spring of 2007. Ippoliti works within the alternative school system utilizing his expertise as a writer, recording engineer and expressionist. His program includes popular music genres, lyric writing and recording. The purpose of the program is to help at-risk students identify problems and learn strategies to cope with expressing their feelings. Educating the mind through the creative process has always been a significant part of Ippoliti's educational philosophy. His musical performances range from theatres, secondary schools, childrens homes, coffee houses and clubs throughout North Texas. A highlight was opening for folk and blues legend, ASCAP Lifetime Achievement Award Winner and Grammy Nominee, Dave Van Ronk in Wellsboro as part of the towns Department of Recreations Canyon Country Concert Series in 2001. Ippoliti is viewed as one of the most influential songwriters to hit the DFW area and is always sure to satisfy even the most critical in music. His most recent move to Dallas, TX is being meet with much success. 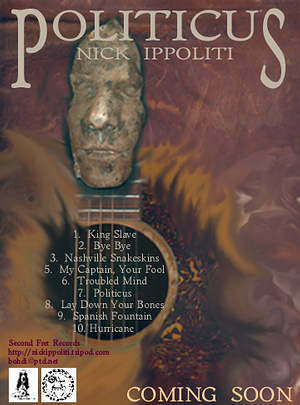 With the release of Politicus (2003), Ippoliti continues to recieve acclaim in songwriting. His educational pursuits continue as he works diligently on a docorate degree in Aesthetic Studies at the University of Texas at Dallas. Ippoliti plans on recording his fourth album in the Spring of 2007. It is tenatively called, Whores of McCallum. Below Watch his HARBOR OF PHILADELPHIA MUSIC VIDEO. It is a personal look into the history of verbal cruelty of past and present immigration. These sounds are intended for the collaborative production of Kartasi; under the direction of Thomas Riccio.